After decades of quietly smoking and grilling away, food trucks have lately earned a lot of attention and column inches. In an era where multiple arugula options and gourmet ketchup are stocked in mass retailers like WalMart it is natural sidewalk sizzlers offer fare for a more gastronomically demanding public on the go. A confluence of factors including economic trends, relaxed urban regulation, stuffy dining fatigue, and simple yet potent communications tools are drawing top chefs to offer top quality and inventive fare atop four wheels. California is naturally the epicenter. The state’s summer 2011 international tourism campaign even focused on food trucks to entice visitors. Recently, food truck staple cities like Portland and Austin were joined by newcomers like Vancouver developing their own scene. Cultures without their own native street food are particularly drawn to internationally influenced and gastronomically intriguing food truck fare. Paris, has given much to the world’s cuisine – from haute cuisine to the humble saucisse and cheese stuffed baguette. Hot on the tails of the much heralded Bistronomy movement of recent years Paris now has its first “food truck.” Opened by French trained American chef Kristin Frederick who hails professionally from Michelin starred Spago in Beverly Hills and more recently revamped the Parisian kitchen of Rice & Beans in the 2eme to rave reviews. Frederick’s venture Le Camion Qui Fume (translation: The Smoking Truck (think Au Chien Qui Fume) focuses exclusively on American burger culture. After a summer of testing (note the above image of a “grueling” testing session naturally paired with champagne) Federick’s burger truck took to the Parisian streets permanently this past week. For a city who embraces most anything of American culture, except maybe American tourists, appetite for Le Camion Qui Fume is already strong. BM: What did you take from French cuisine to make this a great burger? KF:French products! We are using French cheeses, French beef, and bread made for us daily. We will have a burger du jour that will be composed of ingredients which I find fresh at the local market everyday. Clearly you are going to see things that wouldn’t be available fresh to me if I was in the US. I like to think also that since I was trained in France and most of my professional cooking experience has been in Paris that I incorporate a bit of French technique as well. 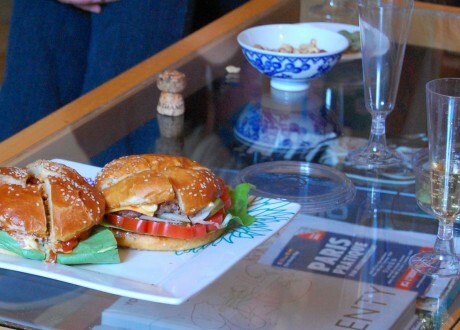 BM: Who are more discerning consumer of burgers – the French or Americans – and why? KF: Haha…well the French are certainly more discerning when it comes to food in general… but burgers might be the one area where I would say the Americans are more critical, well, burgers and BBQ. We’ve eaten so many burgers in our lifetime that everyone can recall their perfect burger. That’s always hard to compete with. BM: Food trucks arguably are one of this decade’s top food phenoms – why does Paris, a culture of UNESCO protected gastronomy – need food trucks? KF: Because every culture deserves delicious street food. Gastronomy is one thing, and I feel very lucky to have the opportunity to enjoy everything Paris has to offer from experimental bistros to classic Michelin-star fine dining. However, there isn’t really a street food movement here, yet. BM: Just as bistronomy has rewritten the rules of bistros in Paris is international cuisine undergoing a similar renaissance in Paris? KF: I hope so. I remember when I first moved here from California I was so disappointed in the international cuisine available here. I realize that a lot of international dishes have been toned down for French palates. In general, French people don’t care for flavors that can be considered overpowering like black pepper, raw garlic, or spicy chilies. Clearly the restaurants have to cater to that sensitivity. Its not surprising the many expats and tourists alike will find themselves eating bland Mexican food, mild Szechwan, and just horrible Indian food. I think that is changing. You can see Mexican restaurants popping up all over town, and although I have yet to see a chili reilleno on a menu, I think it’s not too far down the road. BM: Seriously, what’s the deal with the Parisian high end burgers (€16+) with processed cheese? KF: I don’t know. It’s the reason we had this idea. Ground beef isn’t terribly expensive here…more so when you grind nice cuts yourself like we do but most places don’t. And floppy plastic cheese is practically free so the only thing I can think of is the restaurants are uncomfortable putting a reasonably priced burger on the menu next to a 19€ steak frites (which is also expensive). BM: What accompanies the perfect burger? KF: A napkin. Not a fork and knife. That’s going to be a tough habit for us to conquer. If you watch the people who order burgers in a bistro here everyone uses their utensils to cut away polite bites of burger. In the truck we are going to be encouraging a fork free dining experience. Also fresh fries and a cold beer. BM: Does being in a truck make it better? KF: It certainly makes it interesting. Being mobile is a fun concept. You are not limited by location like traditional brick and mortar restaurants. However, it introduces a whole new set of complications of “where are we going to park today?” That’s part of the fun though especially being the first to attempt it in Paris. We are receiving tons of encouragement from people have been anxious for us to start.